In celebration of the launch of Beautify My Blog, which goes live Saturday, I wanted to give away a few gifts from some of my favorite crafty blogging friends (some of which I have designed blogs for in the past). So stick around this week, and you just might win! Each daily giveaway will end at midnight of the NEXT day. I have quite a few of their candles, and am currently burning Baby Magic (a present when baby Maya arrived). It's a light, fresh, sweet scent that smells intoxicatingly like a new baby wearing lovely lotion. Wes even likes it! That's saying something. Check out some of their new scents for the season HERE. YUM! • Leave a comment for one chance to win. Name and e-mail, please! 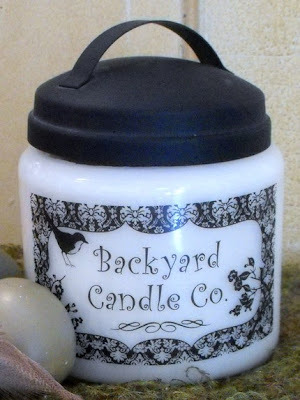 • Put the Beautify My Blog OR Backyard Candle Company button on your blog, then come back and leave the comment Name:Button for a third chance to win. • Giveaway ENDS Wednesday, July 29th, midnight. I'd take a coconut cream pie one! I love love love the smell of coconut right now. It makes me feel like I'm somewhere that's NOT 115 degrees. I would definately want the brown sugar scented candle. It is my most favorite scent of all time! The lavender-scented one would be perfectly relaxing! My favorite scent would be the Movie Night. Sounds great! Count me in! I'm a candle lovin lady. Could I have the Apple Pumpkin Strudel please? Ooh love the baby magic candle, sounds yummy! Aaaand the buttons are up! Oh, I would SO love a blog makeover! How to choose - Maybe pumpkin cheesecake...yumm! I would say Pink Sugar sounds yummy. But I'm also kinda intrigued by Grapefruit Tomato Leaf. I love grapefruit. Sounds interesting. Difficult choices, but I'm going to choose Lemon Verbena. I bet it smells clean and fresh. Yummy fresh scent for this HOT weather. Apple & Pumpkin Strudel- Sounds yummy and perfect for this Fall. I have the beautify my blog button. I love candles. And I love the bird on the label. They all sound promising, but I would probably pick Birthday Cake.